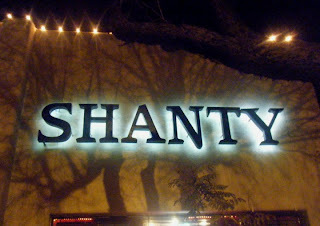 The Shanty is not a shanty at all, and it doesn't appear designed for "shanty Irish." Rather, it's a copper-plated, almost upscale, Irish bar and restaurant, which gives little hint of its age (est. 1937) and with (male) servers that look like they all play on the college volleyball team. The large, shady patio is quite nice, but when I go to a "shanty" -- and especially an Irish shanty -- I expect to see an old, red-faced bartender who looks like he's been there for 40 years and a decor that seems to welcome the lower working class. And when I go to a bar that's 70-some years old, I expect a bit more personality, and to feel its age a bit more. Aside from the old paintings now carefully guarded by ugly plexiglass, the whole interior looks like it could have been slapped together last month from the cookie cutter Irish themed bar template. The service was friendly and I enjoyed the conversations (I'd stumbled into a local meeting of the "Drinking Liberally" group). And perhaps I was spoiled by a previous string of Tucson bars oozing character (Meet Rack, Kon Tiki, Shelter, Buffet). But the Shanty left me utterly uncharmed.